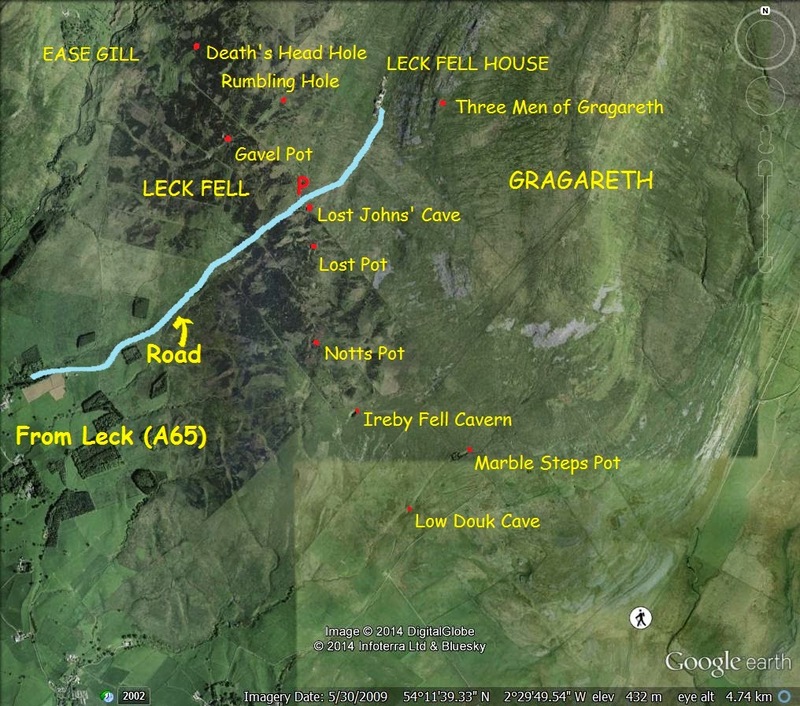 Leck Fell - a Glimpse into Hell? Leck Fell is an isolated limestone plateau - actually in Lancashire, but an essential part of the 'Dales' limestone country. The limestone is covered by a layer of boulder clay and the moorland can be bleak to the timid observer - even off-putting. 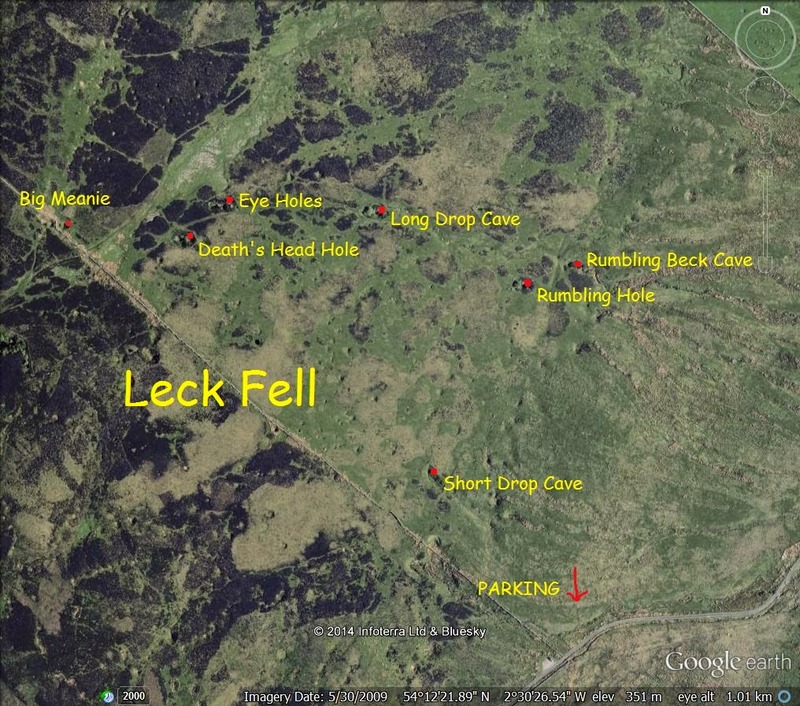 Yet Leck Fell is a fascinating landscape where many ancient and spectacular pothole shafts drop deep into the bowels of the earth to link up with the longest cave system so far discovered in Britain. One of the shafts was formerly known as 'Hell Hole', and for many centuries folk believed these yawning chasms were actually gateways to the lair of his satanic majesty. Great Coum lies to the north, beyond Ease Gill, while the lonely heights of Gragareth rise to the east - overlooking Leck Fell House, surely the most remote dwelling in Lancashire, if not the highest. On this adventure I explored the north west corner of the landscape shown here - where lurk some of the most bizarrely beautiful, yet dauntingly dangerous surface openings in Britain. Leck Fell is private land, and caving strictly requires a permit - but the landowner does not usually object to a lone walker, or a sensibly small group, having a peek at the marvels on show. If great care is taken throughout, and the obvious footpaths adhered to - this is a rewarding place of endless fascination. An obvious car parking spot is reached on the left of the lane which reaches the moor from the A65, two fields down from Leck Fell House - while scanning the skyline above the house in clear weather will reveal the ever present Three Men of Gragareth. As we enter the enclosure to the left we can see how the boulder clay that covers the limestone has slumped to form dolines or shakeholes like this one, due to the activity of water underneath. Following the wall westwards, a fenced hole is immediately obvious to the right, hiding the entrance to Short Drop Cave. Following the wall, as we are, from the parking spot, you can see how we meet the doline and divert to the right (north) to Short Drop Cave, with the forthcoming horrors clearly marked!!! The neat little entrance drops, as the name suggests, into an active streamway and, with sufficient skill, cavers can emerge in Gavel Pot in the next field. Short Drop Cave is a wonderful underground experience with some superb cascades and formations. From Short Drop, a glance to the north will reveal a prominent tree, and approaching it becomes obvious this is hidiing something rather special - if sinister. This is the tremendous chasm of Rumbling Hole, best described by the Balderstons in their classic 'Ingleton, Bygone and Present' (1888): 'We felt spellbound for the moment, and quite unmatched in our cave hunting attire for the felicitous loveliness before us.' They go on to say that: 'In the tables of memory we set it down, that others might revel in what so delighted us, accustomed as we have been both from youth and observation to such scenes.' Clearly, Rumbling Hole's 155 feet shaft left a lasting impression. Whatever the name - this is a mind-numbing place: inspiring equal amounts of awe and delight. Couches of heather and ferns slope perilously down to the drop. The Balderstons speak of: 'mosses, polpody, blechnum and oxalis.' This is a botanist's paradise. This wonderfully coloured spectacle is the view that so captivated those 19th century explorers, a tree at the western end forming a convenient 'v' from which to view the depths of Rumbling Hole. This is believed to be the most ancient of the holes on Leck Fell, probably carved out along a fault by a long vanished water source certainly well before the last glaciation. Even the limestone sides of the shaft are coated with luxurious vegetation. Nearby, a depression on the moor sees Rumbling Beck Cave swallowing a small stream. The stream emerges as a waterfall in the Fairies' Workshop of Rumbling Hole - 8 metres below the surface. A sparkling little cascade forms a pool in the limestone beds before making its way into Rumbling Beck Cave. Peering into Rumbling Beck Cave - a narrow, clean-washed canyon in the limestone. Looking across the fell as we exit Rumbling Beck Cave. Here the uplifted greywackes run along the Dent Fault in Barbondale to form Calf Top: a spectacular sight when catching the sun. After the massive dimensions of Rumbling Hole, we meet this little fella - the cute and aptly named Humble Pot. All shapes and sizes are available on Leck Fell. The entrance to the main passage of Long Drop Cave. This was probably formed by a meltwater channel during a warmer 'periglacial' spell, though its exact age is uncertain. Many of the caves and holes on Leck Fell are plugged with glacial debris suggesting they outdate the last glaciation and are very ancient features. Another entrance into Long Drop Cave. Boulder clay can be seen on the left, having slumped into the hole. And yet another way-in to Long Drop Cave - definitely not for the faint hearted! Returning to the moor, a breeding site for Red Grouse. Their persistent call of 'go back, back, back' may well be a wise one considering what lies in store for us next. Another fenced shaft - this time of a very different nature. This has been largely filled with glacial debris and was no doubt once a much deeper feature. It bears the name of 'The Eye Holes' and you can see why: a splendid limestone bridge forming the top of the nose between the two gaunt sockets. The 'Eye Holes' just have to be explored by the true lover of limestone. You have to clamber beneath that velvety nose, having already come this far! Here I am under the 'bridge' of the nose: a special place. When you stand here, you feel rather special, knowing not many have ever passed beneath this bridge. You are privileged. Exiting the Eye Holes, glance south west to the wall running down the field that marked the start of our adventure. This limestone man, outstetched hand on the left and clenched fist on the right, is the only sign of anything remotely like a human. The glance will reveal another tree - and this time a hole you just don't want to mess with! This is Death's Head Hole, named by Harry Speight in 1892 as the 'Hell Hole' itself, and take great care if you cross the fence. This is the mouth of the Death's Head in close-up, the sinister 200 foot (64 metres) shaft a daunting sight - and some 70 feet (23 metres) down it is possible for cavers to climb into East Passage, a very ancient stretch of cave formed entirely underwater but now left dry and choked by glacial debris. The best time to visit is in the autumn, as during the summer the luxuriant vegetation covers the finest view of the main shaft. Death's Head Hole is humbling to the onlooker - and the modern world seems to be of another planet in comparison. This is the world before we came and spoiled it. The staring eyes of the Death's Head. Here I am standing on one bridge, looking at another, and with sheer drops all around. It's not a place to hang around long. Sinister if not bizarrely so, Death's Head Hole makes even experienced adventurers shudder. An amazing place. ... and a big one at that, for this is 'Big Meanie'. 'Mean' I suppose in that it looks like a cute little walk-in cave entrance compared to what we've encountered up to now ... but not far inside a huge 49 metre shaft plunges into the bowels of the earth, so don't even think about entering. Even worse, the first few metres of the drop are tight, and squeeze the caver's delicate parts before he finally hangs in the black void. Mean indeed is Big Meanie. Big Meanie is easy to find as it lies in a shakehole alongside an obvious 'chink' in the stone wall. It was probably carved out by meltwater stream. If we could pull off all that boulder clay, we would see the gleaming limestone underneath in which Big Meanie has formed. It's then a case of following the wall back to the starting point - that way, at least you know you're not goiing to fall down any holes. Can you believe it - I met another human!!!??? His words were, in an American accent, 'I'm a just gowna chick out da big meaneeeee' .... I thought I was dreaming. There's others as mad as me in the run up to Christmas. When you've been 'almost under' for a couple of hours you feel like goiing 'up' and surveying it all, and there is no better way than climbing Gragareth. To do this we follow the lane up behind Leck Fell House .... is that Sky tv I detect in this 'untouched' landscape???? Argh!! What a view though, as we climb, across to Barbon Low Fell and beyond to Morecambe Bay and the Lake District. The field containing all the potholes we've just visited lies, heather-clad, to the left. The view across to Calf Top, the massive uplifted wedge of Ordovician rocks uplifted along the Dent Fault. The sun then reappeared and the view was just ... well, stunning. A scramble up off the path behind the house, and we meet the Three Men of Gragareth. At over 2000 feet this might look a drab mountain, but trust me the views are UNBELIEVABLE!!! How do they remain standing in the elements that must hammer at them, unrelentingly? Well they can occasionally!!! Here's the Four Men of Gragareth. Self portrait this one ... set the ten second time and leg it! One of my favourite places on this planet. It was indeed mute. Wind, sheep, birds, vehicles .... none of them interrupted absolute silence. There was a living world down there somewhere. I had to kick myself to believe it. Gragareth is formed of the same Yoredale series of alternating sandstones, limestones and shales that make up the more shapely Three Peaks. Amazing to think that these layers were laid down over a vast amount of time by fluctuating sea levels. All this lot was once under water, and near the equator! Geology and the Dales have never-ending stories, more spectacular than any we create. And the last glimmers of November sun warmed the cockles of the Three Men. Then it was a melancholy wave goodbye to old friends from an Oldfield. ... had become a glimpse into heaven.